A fun sport for beginners and experienced shots alike! In Michaelmas and Lent we mainly shoot indoor .22 rifles at 25 yards with CUSBC (Cambridge University Small-Bore Club). There are frequent matches including the much anticipated cuppers (pairs from each college competing against each other). From the Easter holidays onwards we move our focus to outdoor .308 rifles alongside CURA (Cambridge University Rifle Association), shooting up to 1000 yards without scopes and 1200 yards with scopes- that’s over a kilometre! 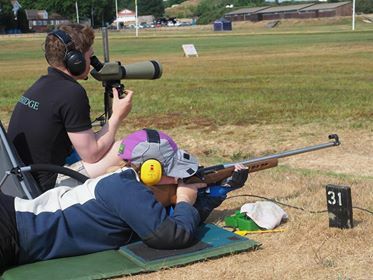 As we shoot with the university clubs there are also three varsity matches throughout the year in the different disciplines: 25yd .22, .308 unscoped and .308 scoped. Rifle shooting is a half blue sport (with discretionary full blues).